D.C. based adventurers looking for a weekend getaway to Harpers Ferry or “the psychological halfway point” of the Appalachian Trail can easily hop on a train to West Virginia. Thank you to community member David Davis for submitting this guide! Do you have an adventure, tips, tricks or other stories you want to share with the Mappy Hour community? Check out our submission guidelines here. It’s still dark outside and there’s a damp chill in the air. We amble through The Point, a small park with a view of where the Shenandoah joins the Potomac. Looking downriver Maryland is to the left, Virginia to the right. Where we stand is in West Virginia. I give my daughter another minute to watch the rivers, the railroad bridge, and the 19th century town that rises precipitously behind us. In a few minutes, we’ll be on a train headed for home carrying a pack and wearing our boots, still feeling a bit like we’re out hiking. Everyone else onboard will be dressed for any given day at the office. 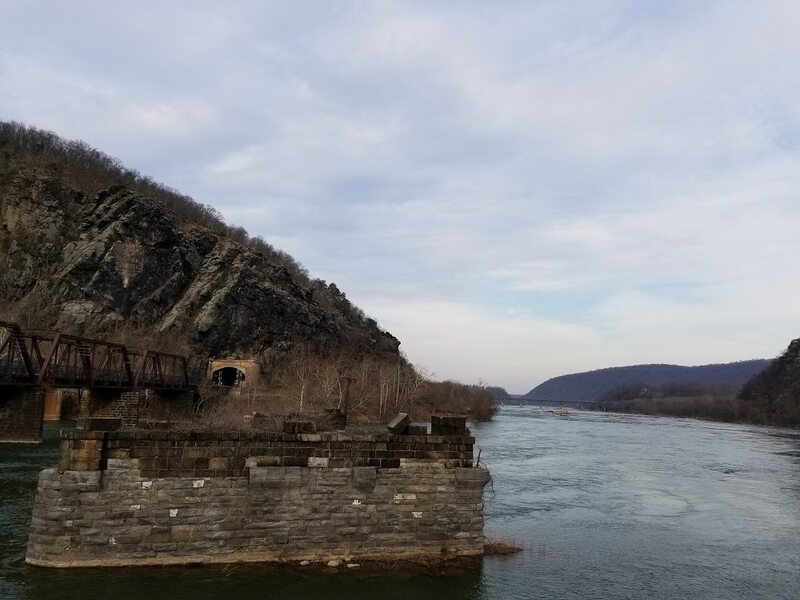 Harpers Ferry enjoys a place as a trail town on both the C&O Canal Towpath and the Appalachian Trail, where it’s considered the “psychological halfway point” by thru-hikers. It’s a couple of miles away from the foot of South Mountain, where the trail ascends a series of switchbacks to Weverton cliffs, with Potomac Appalachian Trail Club (PATC) shelters and cabins beyond. With a train station serviced by Amtrak and MARC, Harpers Ferry is also roughly an hour from DC by train. Amtrak and MARC also both happen to share stations with Metrorail’s Red Line at Rockville and Union Station. This makes Harpers Ferry a relatively convenient start- or endpoint for DC-area backpackers and cyclists interested in weekend trips, but who don’t want to bother with a car. Amtrak’s daily run, the Capitol Limited, departs Union Station seven days a week at 4:05 PM and arrives at Harpers Ferry around 5:15. The DC-bound train (which originates in Chicago) is slated to depart Harpers Ferry daily at about 11:30, but that’s less precise. The one-way cost between DC and Harpers Ferry via Amtrak is $13. A secret hiding in plain sight, MTA’s MARC Rail also connects DC to the suburban hinterlands of Maryland and West Virginia, though much further afield than the areas serviced by Metro Rail. And while MARC shares the aforementioned Metrorail stations (plus Silver Spring), this is where the similarities to Metro end. MARC has helpful conductors who answer questions while they tear tickets at the doors. Whereas eating French fries on the Metro is a transgression that can result in a rider leaving with the Transit Police, MARC passengers can eat and drink with impunity. In the evening, it’s not uncommon to see groups of riders chatting and sipping a beer or a little wine. Alas, MARC only services Montgomery County and parts west Monday through Friday. Trains bound for DC are available weekday mornings, and outbound trains run in the late afternoon and evening only. These schedules mean that weekenders will likely need to stay a night near the station. When longer daylight hours permit, city dwellers itching to camp can reach Huckleberry Hill Hiker/ Biker Overnighter, two miles and change west on the Towpath, with time to set up camp and make dinner. For those who prefer swank accommodations, there’s a long wait. The years-long saga of the Hill Top House Hotel renovation appears to once again be moving toward resolution in the form of a high-end hotel, but current plans won’t see guests checking in until July 2021. The lesser known town of Brunswick, MD lies about ten miles east of Harpers Ferry on the Towpath. The town is roughly the same distance from South Mountain as its West Virginia neighbor, though hikers will approach Weverton Cliffs from the east. There’s a motel a couple of bed and breakfasts, and the Brunswick Family Campground. Brunswick also has its own MARC station with more arrivals and departures than Harpers Ferry, including a Friday afternoon train that leaves DC at 1:30 and arrives in Brunswick around 3:00.